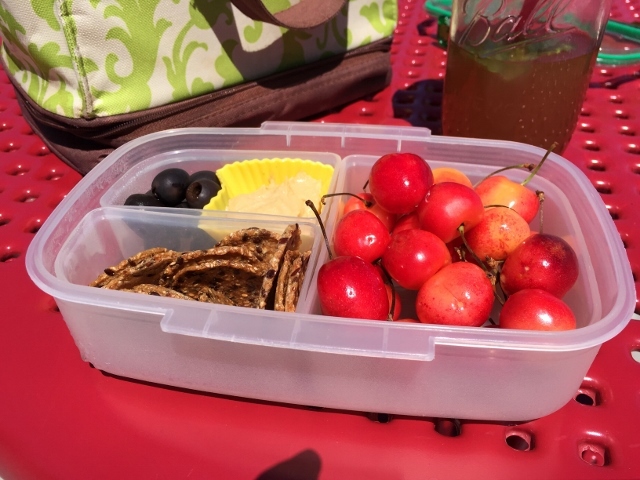 Summertime and packing lunches are two things that just don’t naturally go together. Instead, I suppose we should be talking about summertime with popsicles, ice cream, and lemonade. 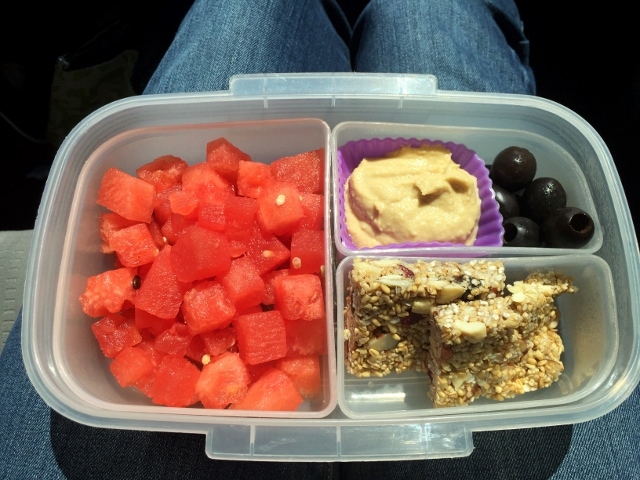 Packing lunches seems more at home with the likes of back-to-school, busy mornings, and zippered plastic baggies. 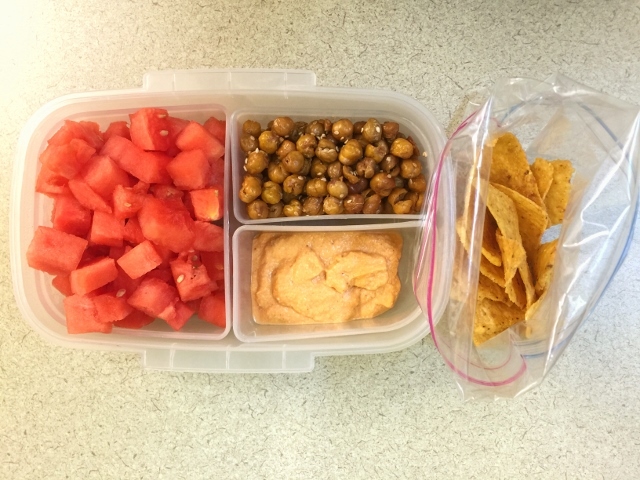 But, alas, I have been spending a considerable amount of time in my office at the college lately which has necessitated a little creativity in the lunch-packing department if I don’t want to end up with pb&j everyday. 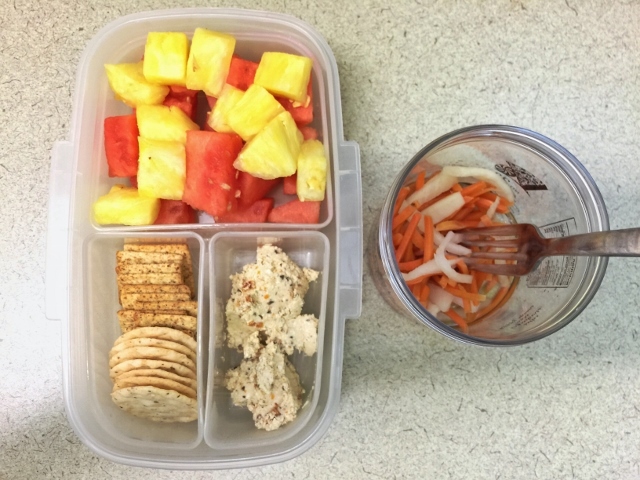 For those of you who want to forget about the chore of planning for and packing lunches for your kids until August or September, please feel free to ignore this post. But for those of you who pack a lunch through every season of year, I’m offering up 10 of my recent favorite lunch ideas (in my handy-dandy bento-style box) in case it inspires new products, recipes, or tasty combinations for your noon-time noshing. This one was pretty simple to pull together. The only prep that happened before the “morning of” was making the Whole Foods Homemade Granola Bars. I think I was low on whole oats so used a combination of whole oats, steel cut oats, and oat bran. 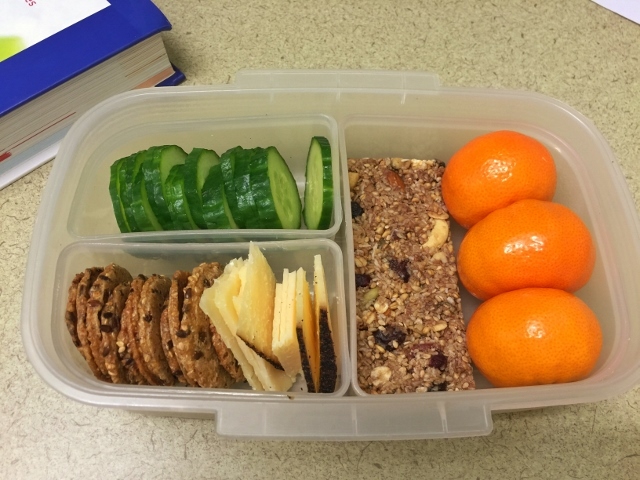 Otherwise it was just some slicing and portioning to fill this particular lunchbox, which appears to do a pretty good job of covering all the food groups: vegetables, fruits, protein foods, and grains. (It had better. That’s a nutrition textbook edging into the photo.) Also pictured: sliced cucumber, Mary’s Gone Crackers (Original), Barely Buzzed espresso-coated cheese, and mandarin oranges. This yummy bento takes a little bit of assembly once you have all the component parts. 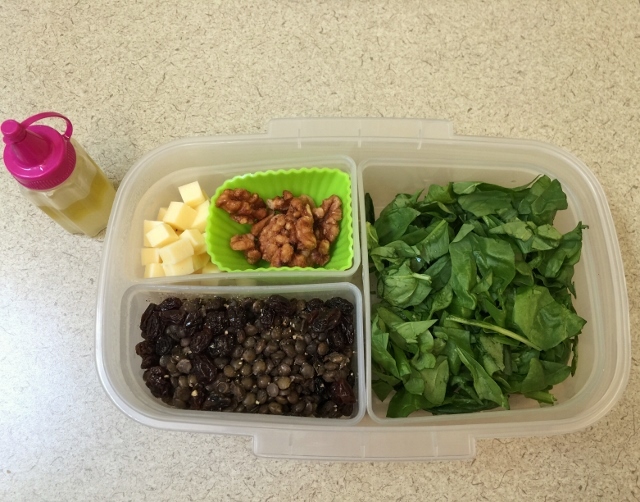 The recipe will be on the blog someday soon, but for now I can tell you this salad’s got spinach, lentils, raisins, candied walnuts, white cheddar, and a lemon vinaigrette. After this picture was taken I tossed it all together with the dressing. Sweet, savory, salty, awesome. The weather started to get really nice in June, so I ate many a lunch outside instead of at my desk. 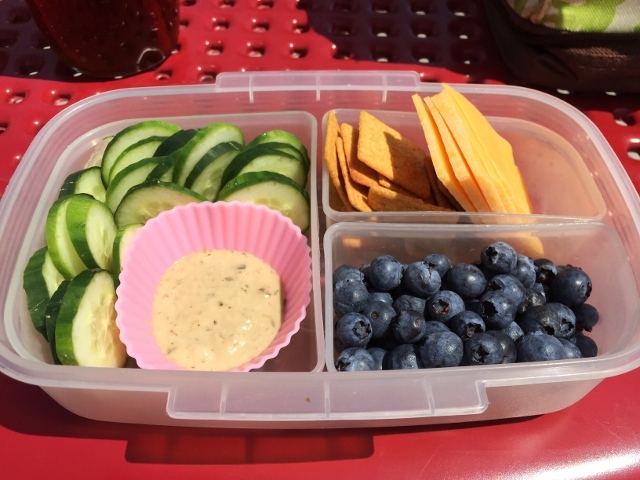 On this day I had sliced cucumber with Annie’s Goddess Dressing for dipping, accompanied by Wheat Thins, cheddar cheese, and fresh blueberries. Think you don’t have time to pack a lunch? This came together in just under 3 minutes. One of my favorite all-time cheeses is Kerrygold Dubliner Cheese. So when I saw that they’d come out with a spreadable product, Dubliner Cheese Wedges, similar to the Laughing Cow triangles, I had to give them a try. They’re made with real cheese and have only 45 calories per wedge. 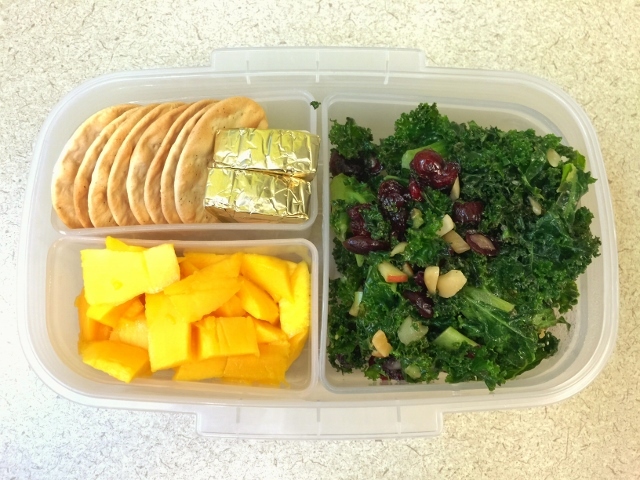 It was perfect on the cracked pepper water crackers, which I enjoyed alongside fresh mango, and a leftover kale salad topped with dried cranberries and sliced almonds. Again, not a bad representation of the food groups. USDA’s MyPlate encourages us to make half our plate fruit and vegetables. They don’t give specifics for if you eat out of a compartmentalized box, but I’m guessing it’s about the same. I only gathered together two items for this monochromatic bento, and while it’s not going to win any points for visual appeal and food styling, it was incredibly filling. The first is a modified version of salad #36 from Mark Bittman’s list 101 Simple Salads for the Season. 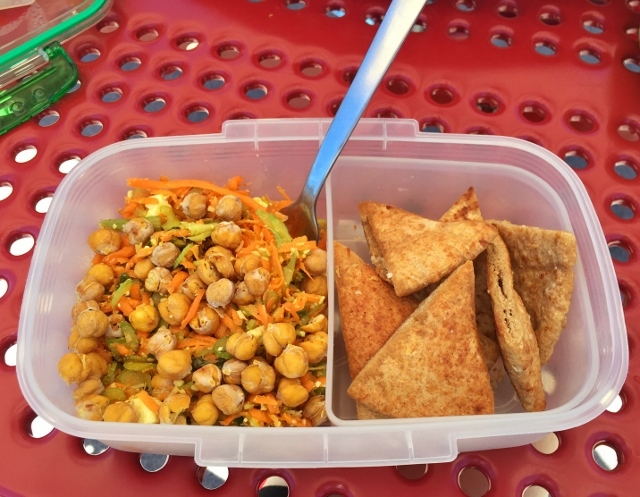 Mine was a mixture of roasted chickpeas (olive oil, salt, and pepper), toasted coconut, shredded carrot, chopped celery, curry powder, olive oil, lime juice, basil, and feta cheese. The second was homemade whole wheat Pita Chips from Heidi Swanson’s cookbook Super Natural Every Day. A perfect pairing. 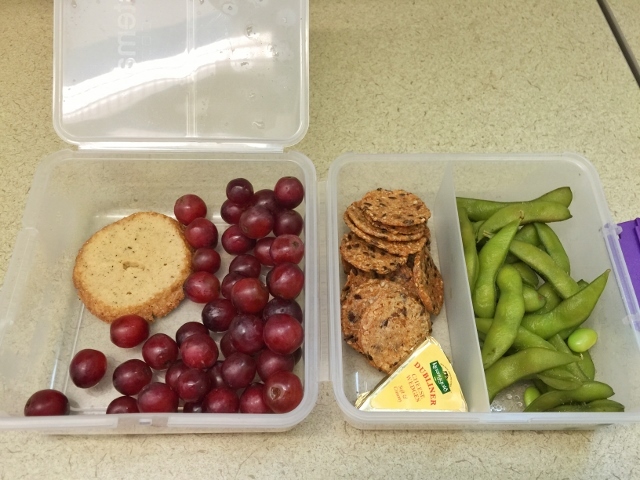 I used a different box for this lunch, which gave me a little more space but I still paid attention to portion size. No real prep on this one, except to boil the frozen edamame ahead of time. With it I had some repeats from above like Mary’s Gone Crackers (Original) and Dubliner Cheese Wedge. Dessert was grapes and a bake-your-own Chai Tea Shortbread cookie from my local supplier of sweet treats, The Bitter Baker. A quick note about beans. They may not be your typical go-to lunchbox filler, but they should be. For vegetarians they provide some unique, necessary nutrients that should show up in our mouths multiple times a day, like iron, potassium, and zinc. For non-vegetarians they’re also a fantastic source of protein with plenty of fiber. And it doesn’t have to be boring or monotonous. You can mix it up. There are plenty of convenient options like cold cooked lentils with vinaigrette, crispy oven-roasted garbanzo beans, hummus, refried beans with salsa, or the appetizer-style edamame (soybeans). Now that sounds like the essence of summertime. 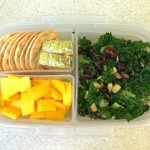 If having only 10 lunch ideas leaves you wanting, check out 5 more in my original bento post here. How are you taking advantage of summer’s bounty to feed yourself at lunch?